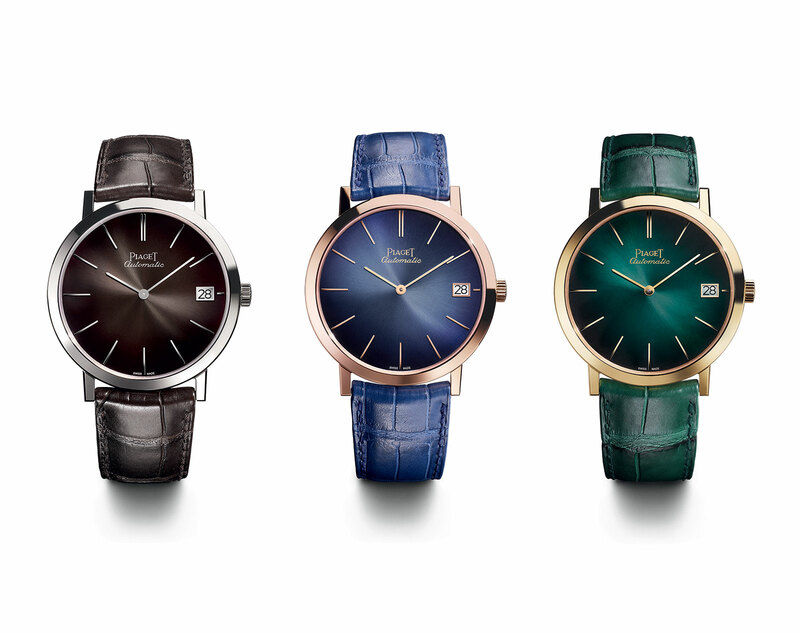 A trio of slim gentlemen's watches with bright metallic finish dials. 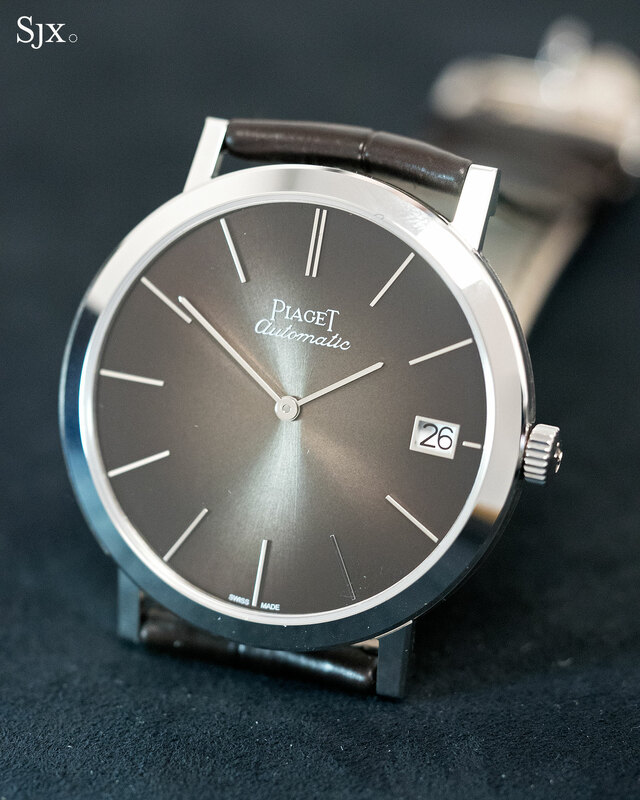 The extra-thin watch is not exclusive to Piaget, but it’s almost synonymous with the brand, given its long history in developing slim movements. 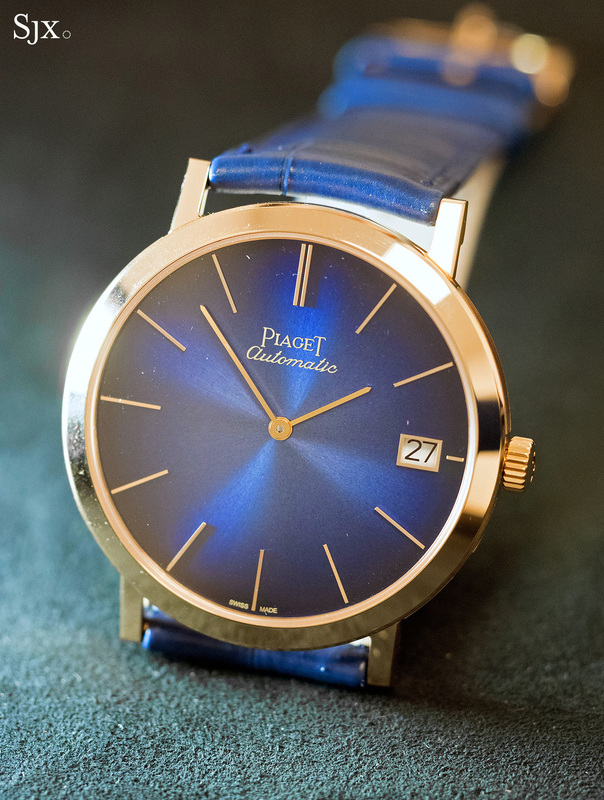 It’s 60 years since Piaget rolled out its first extra-thin movement, the hand-wound cal. 9P of 1957 – which means a slew of watches to commemorate the occasion. All share an simple aesthetic modelled on the original – essentially a thin case with a dial featuring baton markers and hands – but the trio of automatics with coloured dials are more vivid than the usual slim dress watch. All share the same 40mm gold case (in the three different colours of gold) that has a flat, polished bezel, along with matching lugs that give it a clean style consistent with the dial. The case is 6.36mm high, with the case back being slightly domed, leaving the watch sitting slightly thinner than it is. 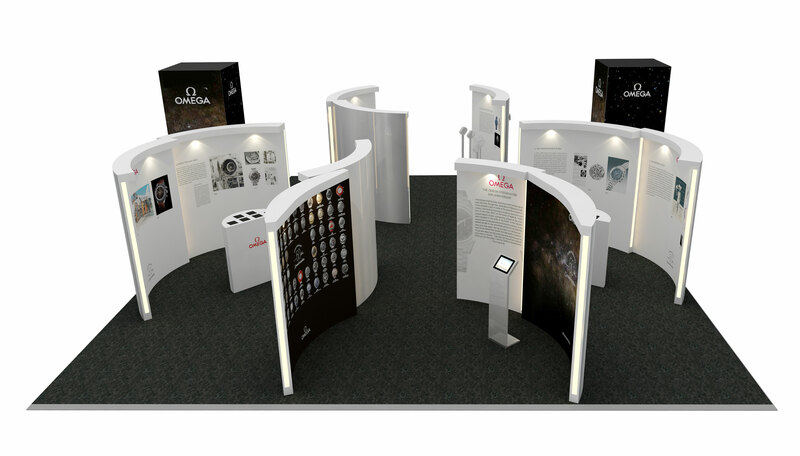 Visually the case design varies little from the 1960s original, but as with all modern watches the construction is significantly more robust, allowing for a water-resistant rating of 30m. 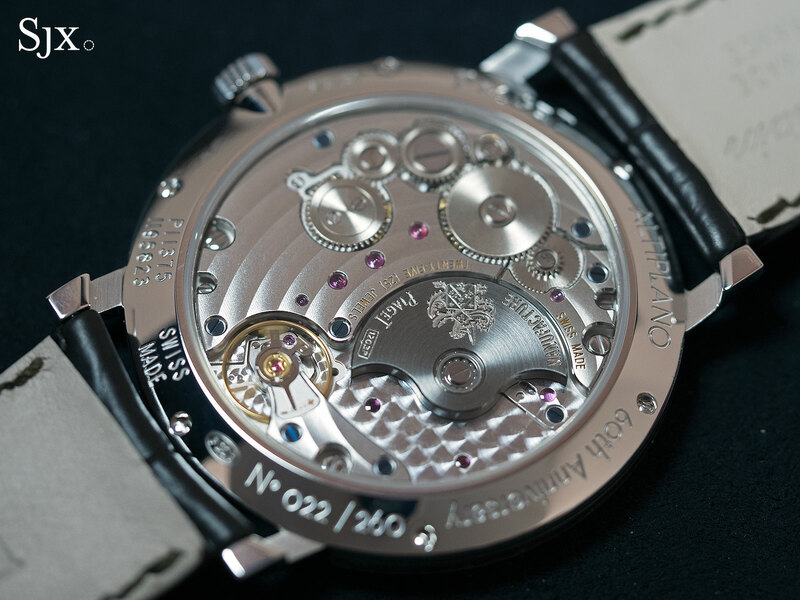 Notably, the case back is held in place by half a dozen screws, which helps with moisture-proofing, instead of the usual snap-back found on thin watches. The dial is just like the 1960s original as well, with stick indices and hands, along with the distinctly retro “automatic” rendered in italic script. A gilded frame highlights the date at three o’clock – a feature that is unusual on an ultra-thin watch and eminently practical, but one that also feels out of place. It doesn’t help that the date disc is white, giving it significant contrast against the dial. What makes the trio stand out are the dial colours. 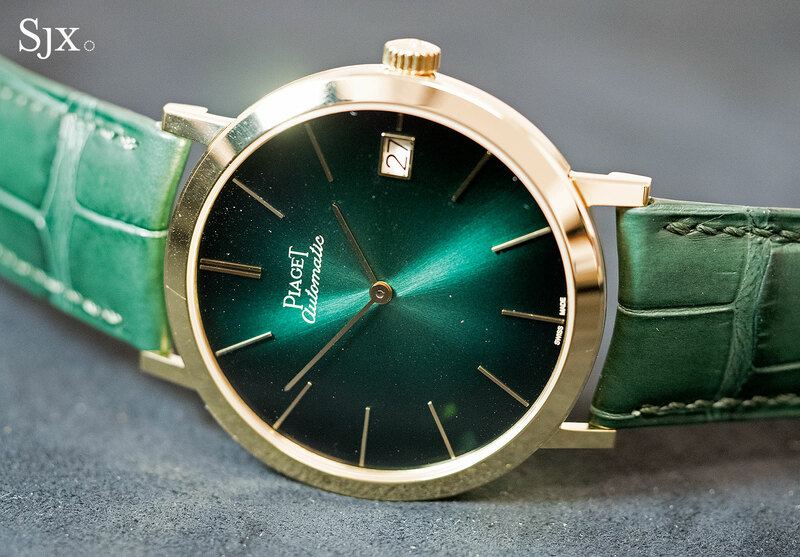 While the typical extra-thin dress watch will have a silvered dial, Piaget decided to bestow bright colours on this trio, in in blue, green and a grey-brown. The dials have a radial brushing with a galvanic colour coating, giving them an appealing metallic finish that catches the light brilliantly. 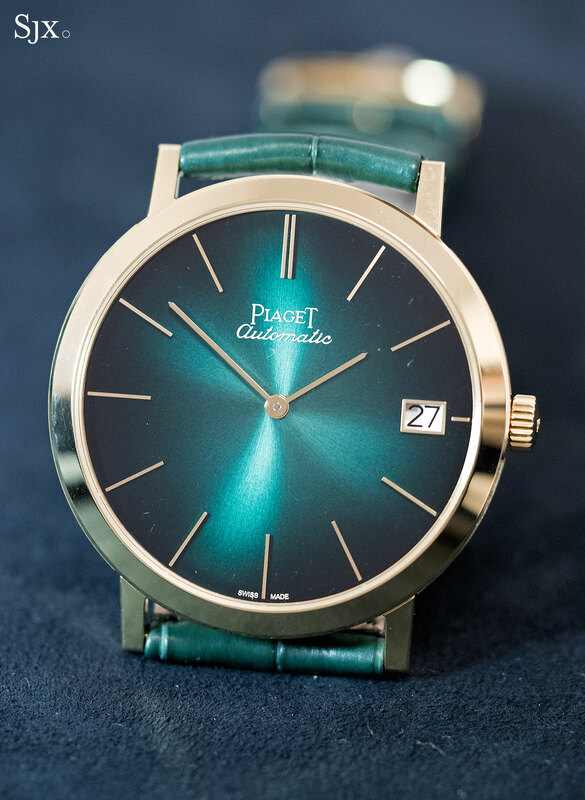 Both the blue and green dials make a statement, even from a distance; they are dress watches that want to be seen. 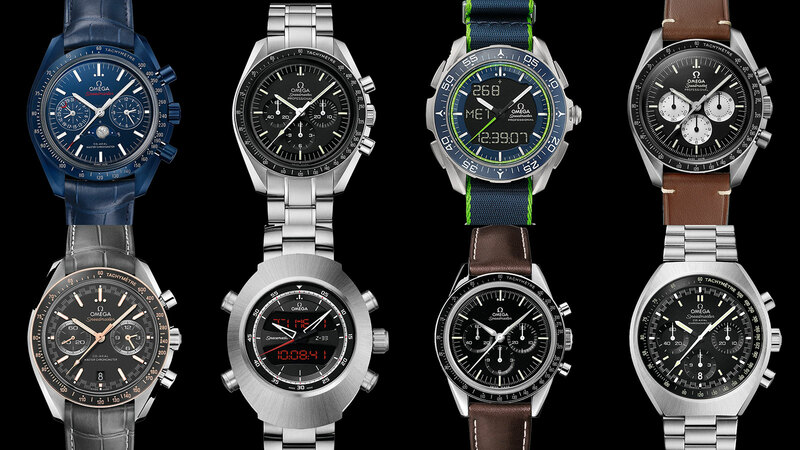 The grey dial is arguably the pick of the lot, usual but still subtle. Described as a “grey patinated” finish, the colour is a grey-brown that’s not often seen. All three share the same cal. 1203P movement, an automatic that’s just 3mm high. 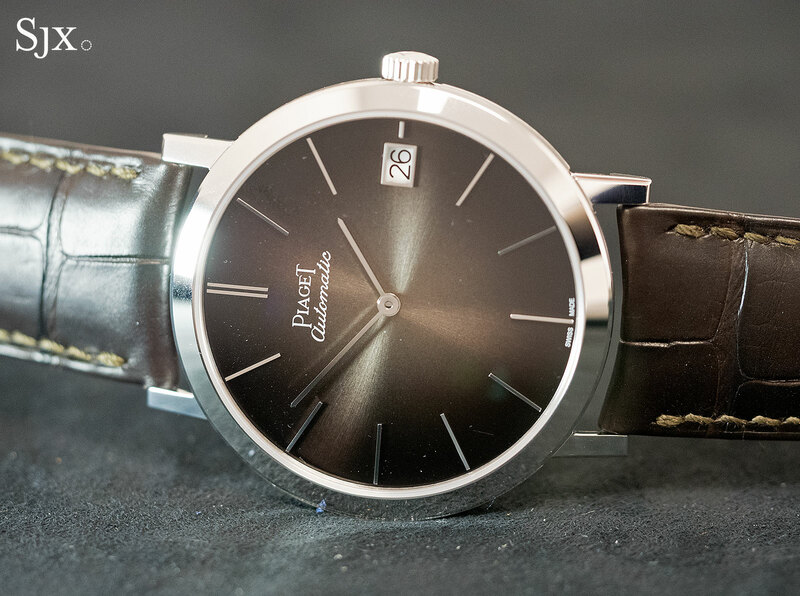 The construction and finishing is typical of Piaget, with the key features being a micro-rotor off to one side and a smallish balance wheel beside it. Together they allow the movement to be compact while maintaining a respectable 44-hour power reserve; a smaller balance consumes less energy while allowing for a large barrel, and the micro-rotor reduces movement height. The finish is carefully done with all the details taken care of – circular striping, blued steel screws, polished countersinks – though most of it is done with mechanical aid. 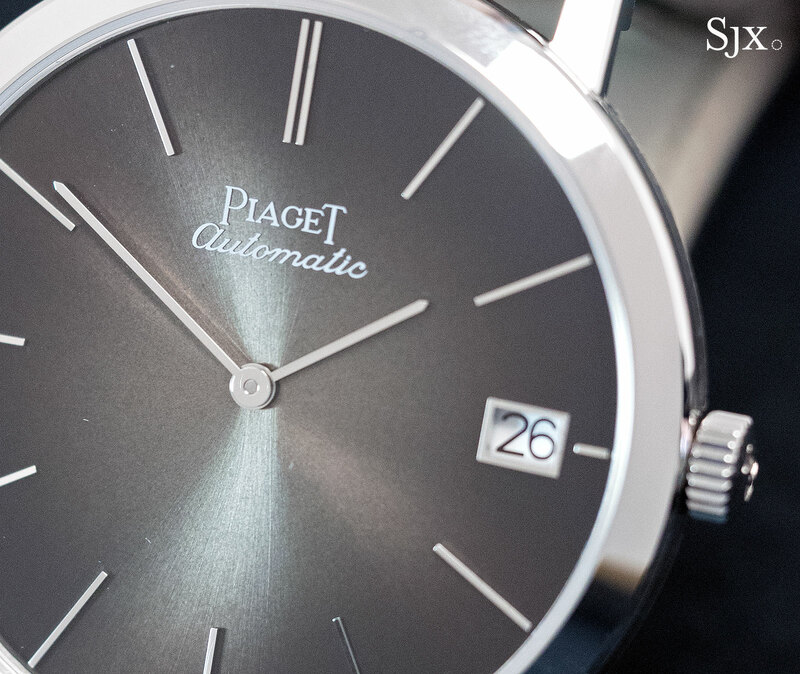 That mix of manual and mechanical finishing is par for the course at Piaget and many of its peers, like Jaeger-LeCoultre and Blancpain. The Altiplano 60th Anniversary ultra-thins cover all the bases for a slim dress watch with appropriate styling and technical competence, though the price feels steep. To be fair it’s less than what comparables cost before the watch business entered its current slump, but with fellow watchmakers – even sister brands in the same group – making their watches more affordable the competition is though. For instance, the Lange Saxonia 37mm, admittedly a hand-wound with a plainly constructed movement – costs just under US$15,000. 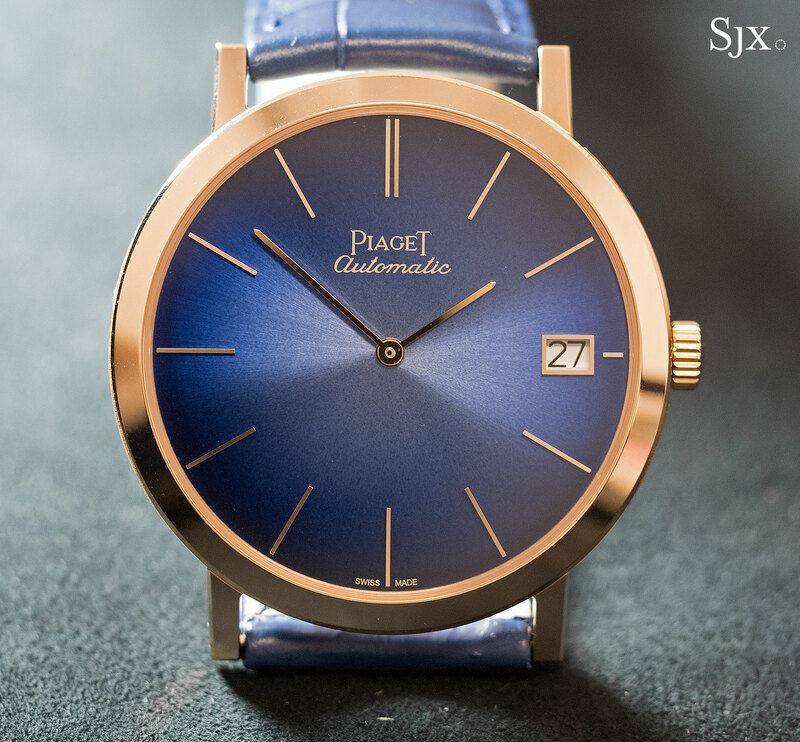 Already available at Piaget boutiques and retailers, the Altiplano 60th Anniversary ultra-thin is available in pink gold with a blue dial (ref. G0A42051) or yellow gold with a green dial (ref. G0A42052), each priced at US$25,200 or S$35,900. The version in white gold with a grey dial (ref. 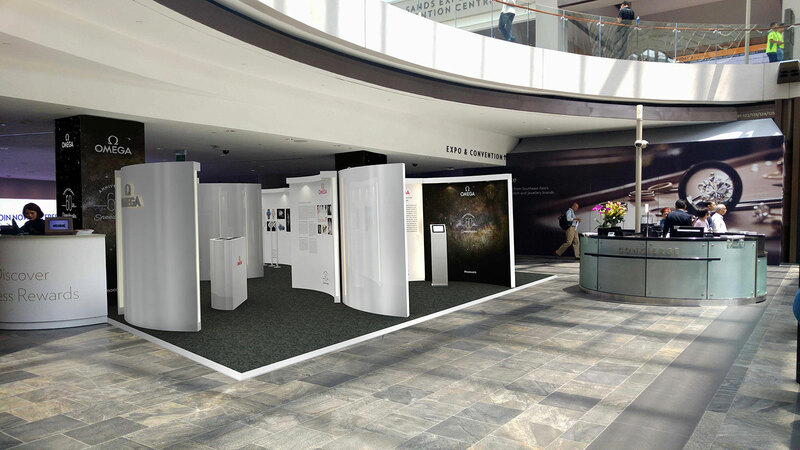 G0A42050) costs US$26,000 or S$37,400. Each is limited to 260 pieces. 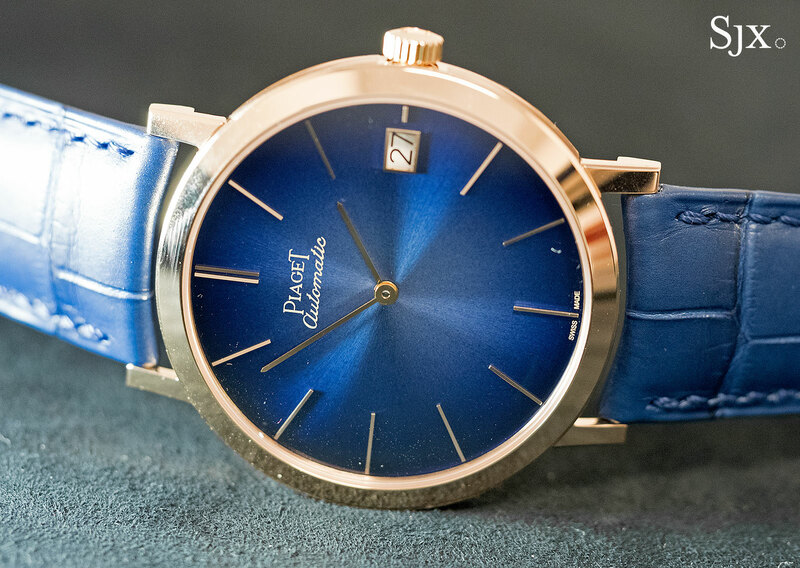 Piaget marks the occasion with new, brightly coloured dials for the Altiplano, as well as a slim tourbillon.